The Portsmouth Music Festival's Guitar Section was held in the Menuhin Room at the Norrish Library, Portsmouth. Guitar Section Adjudicator was Adrian Neville. 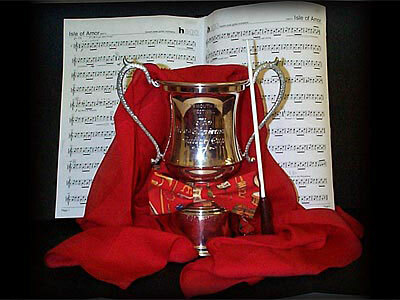 hago was awarded first place in the Guitar Ensemble category together and held the Vice Chairman's Cup - pictured right - for a year. hago are invited to play in the Winners' Concert at the end of the Festival. You really enjoyed this piece and it was reflected in the playing. Good balance and interplay between parts. Excellent rhythm, dynamic control and variety.